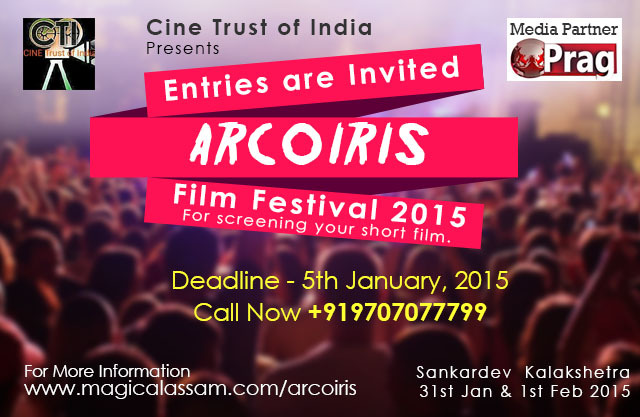 CINE Trust of India, a socio-cultural organisation dedicated to film & art invites entries from filmmakers for participation in the “ARCOIRIS Film Festival 2015” to be held at Sankardev Kalakshetra from January 31, 2015. ARCOIRIS is a very good platform for zero budget filmmakers to showcase their talent. The previous version of ARCOIRIS film festival held at Rabindra Bhawan, Gauhati University and Tezpur University. Panellist : Prodyut Kr Deka, Poran Borthakur, Tarunabh Dutta and Mallika Buragohain. ARCOIRIS is always motivated to bring good cinema, its language and various pursuits closure to the common viewer. It is steadfastly motivated to push fresh new talents and aspiring film makers to newer heights. The starting point is to exhibit films that have a lot of depth and artistic integrity – films that viewers and audiences can identify with and in the process, create a congenial viewing climate. The idea behind it all is to create a sound atmosphere where ideas could be exchanged and basic techniques can be imparted.